The books should be the thickness of a housebrick & the three of us having to do weight training in order to be able to hold it long enough to read! Oh I think their arm strength is improving. They're not working out at all, but every time I leave any of this household alone for ten seconds, a pillow fight immediately breaks out, so I think they're getting plenty of exercise. 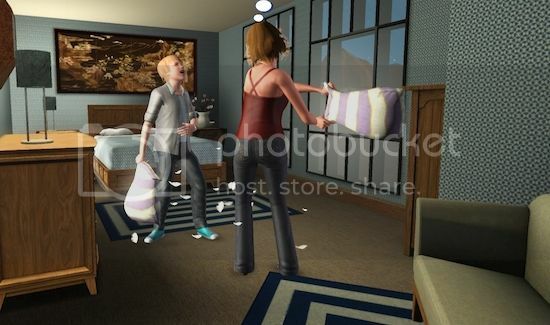 Actually I like the pillow fights, it's quite cute and they have a lot of fun! In other news, my first alien abduction has finally occurred! I can't quite believe it. After hours of staring through telescopes and collecting space rocks in other saves, it finally happened for no apparent reason and with no space-related items on the lot. I was so squee and nervous for the sim, but then it was over so quickly and she seemed entirely unscathed. Quite dull actually. The pillow fights are more intense! Ah well, goodness knows when it will happen again so at least I got to see it! Indeed. 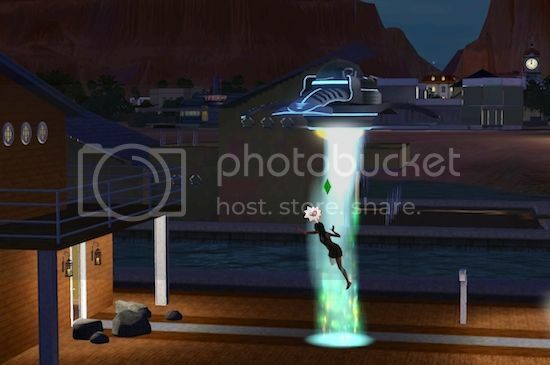 That's why I wanted your sim to get abducted and probed. I wanted to see just how green the progeny could be! Well. I thought I'd have a crack at this DIY car thing. 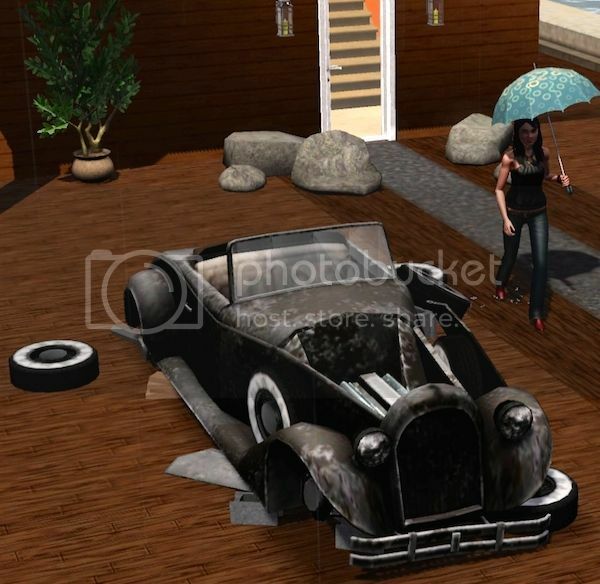 The car is a heap of junk to begin with. Despite not having a functional engine and the bodywork being shot to hell, you can apparently still use the radio. OK then! It also seems to come with more wheels than you need, but never mind. As a bonus, it's really cheap to buy. Fixing it up involves either hitting the engine with a spanner or spraying the paintwork. I thought I'd do the engine first. 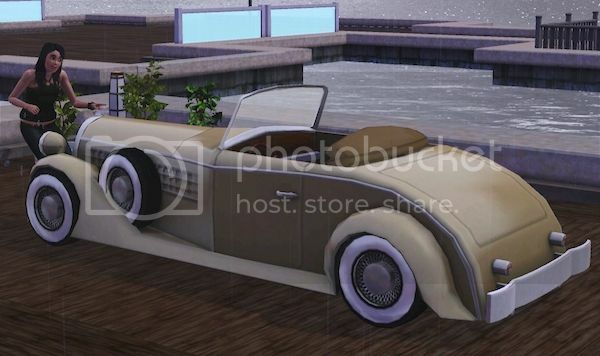 I don't know how long it will take for this rust bucket to become a thing of beauty, but poor Vanessa got mighty bored standing in the rain whacking the hell out of it. I switched her to working on the paintwork the next day. She may have misunderstood me because instead she appeared to spend a lot of time blowtorching the interior. She decided she'd better check on other neighbourhood simmies, so threw a feast party at Halloween. Everyone turned up with delicious-looking goodies (mostly) and did a spot of dancing. Vanessa was excited that Bluebell Flora turned up to the party complete with a plate of country bread! Yes - bread! Woooooooh! Caspin was totally willing to dance with Minty. Minty was totally willing to stomp all over Caspin's feet! Should have worn boots with steel toe caps. He looked very scared so I think Caspin may have uttered one or two threats to his person. Ollie sat straight-faced on the sofa and did his best not to laugh at his housemates' unfortunate antics. Looks like he swallowed that country loaf whole! 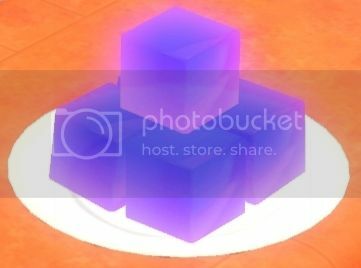 Someone turned up with a plate of glowing purple cubes! At first I thought they were possibly jellies but then I looked and they were called something depressing like "nutrient cubes". If this is the food of the future, just shoot me! They look nicer when you start eating them, as they have different colours inside. I think I liked the chocolate gnomes better. I might write to Lindt to suggest the possibility of chocolate gnomes instead of those bunnies they always make for Easter. Anyway, it was a good party and my sim's feet will probably recover in due course. The next day, however, my DIY car project was placed in jeopardy by one of those "why is the sky suddenly so dark" messages. Waaaaaaah! My house! I just redecorated that! 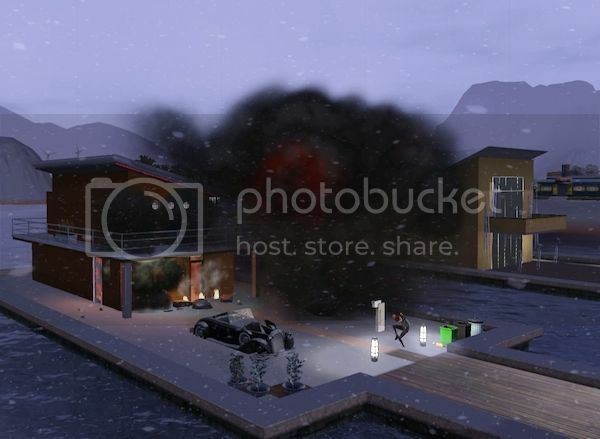 Fortunately, the meteor missed the car. Hahahahahaaaahaaaa! It only took out the rest of the house and yard. It was certainly a speedy way to get rid of all the furniture. 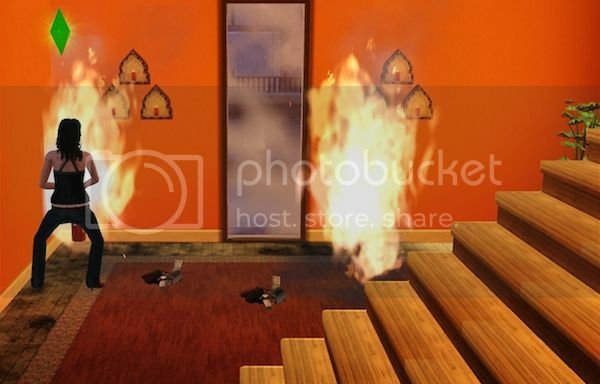 Fortunately I had made Vanessa run away so she wouldn't be killed and she was sufficiently competent to put out most of the flames before the firefighters got anywhere close. Outside, however, some passers-by behaved strangely. 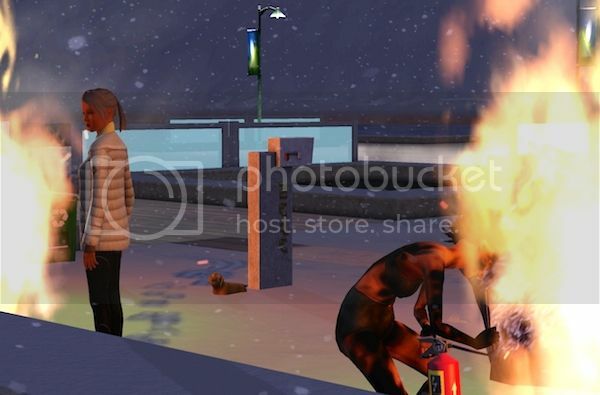 The lady on the right repeatedly ran into the flames, then pulled out a fire extinguisher and spent some time spraying it into her eyes while standing within a ball of fire. The lady on the left just strolled by nonchalantly to browse for some massive flames, seemingly untroubled at the concept of being engulfed. I was worried for her, as she seemed to be wearing one of those puffer jackets that are stuffed with flammable materials. Meanwhile a small dog looked nonplussed near the postbox. But the car is fine! It is still junk, but unburned junk. 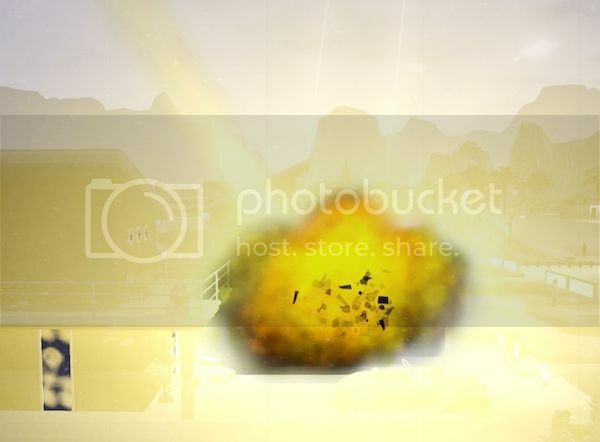 EXCUSE ME, MR METEOR, YOU ARE ATTACKING THE WRONG FORUM'S MEMBERS. 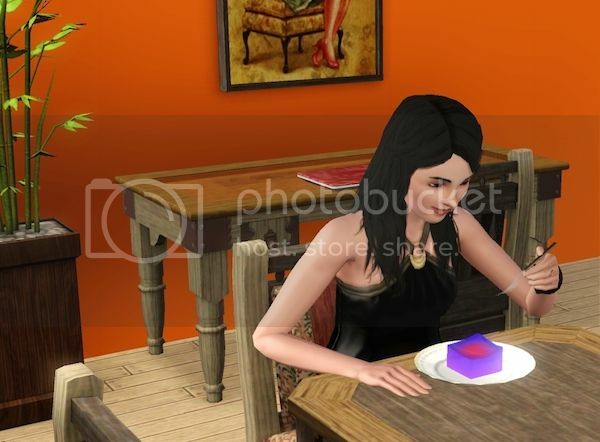 Aw, poor customsims, you meanie! Actually they should count themselves lucky - from my current game I have learned that I am less likely to be injured by a meteor strike than by dancing with Minty. 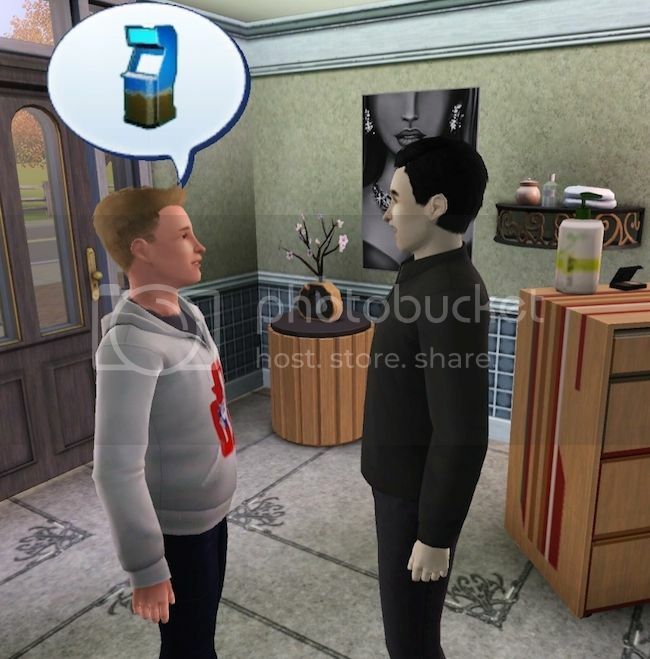 OK, no picking on Minty's sim today. I swear! Threw another party and things quickly turned chaotic. 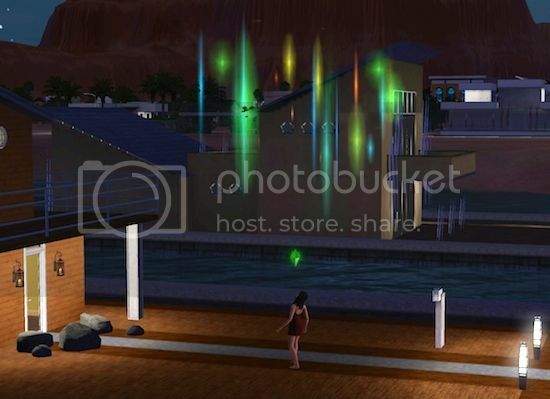 The aliens must have really enjoyed probing Vanessa, as they turned up at the party. Uninvited - outrageous! 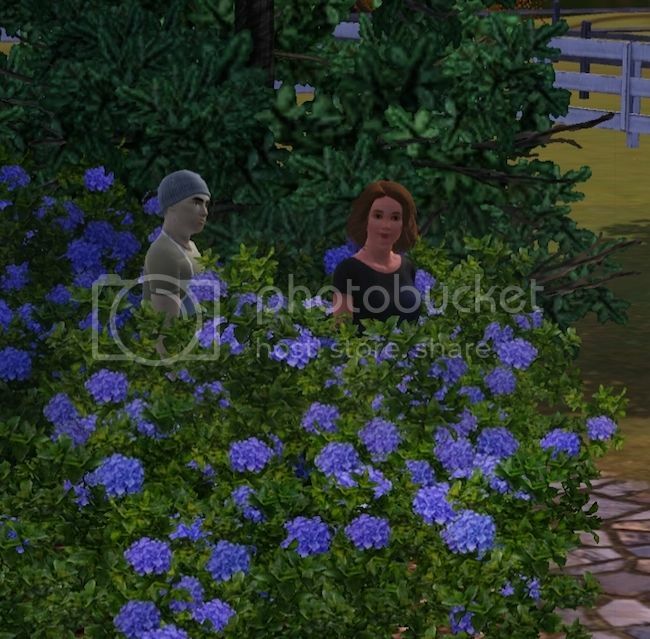 To liven things up, another uninvited guest turned up with a scythe, resulting in the departure of this elderly sim, who was a gatecrasher anyway! I am glad that parties in real life are not thus action-packed. 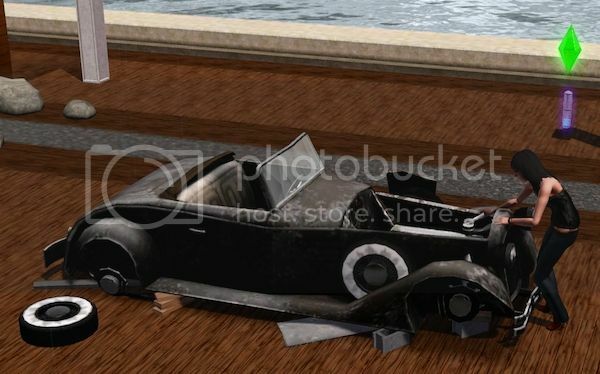 In other news, the bodywork of the fix-it-up car is finished! Still cannot drive it anywhere, due to the lack of an engine, but it is progress and less of an eyesore in the front yard. Got my first imaginary friend doll. What a creepy-looking thing! Don't they know a lot of people have a fear of clowns? Actually I'm not sure which looks scarier - the doll or the kid?! 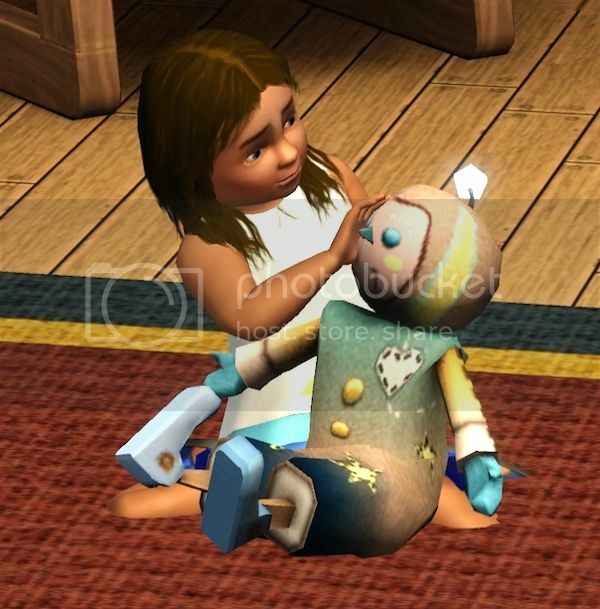 Oh well, when she gets back from art school I guess I can always delete the doll if it is annoying, although I am interested to see it become a sim, as I can't imagine how that face would translate into human-like features. 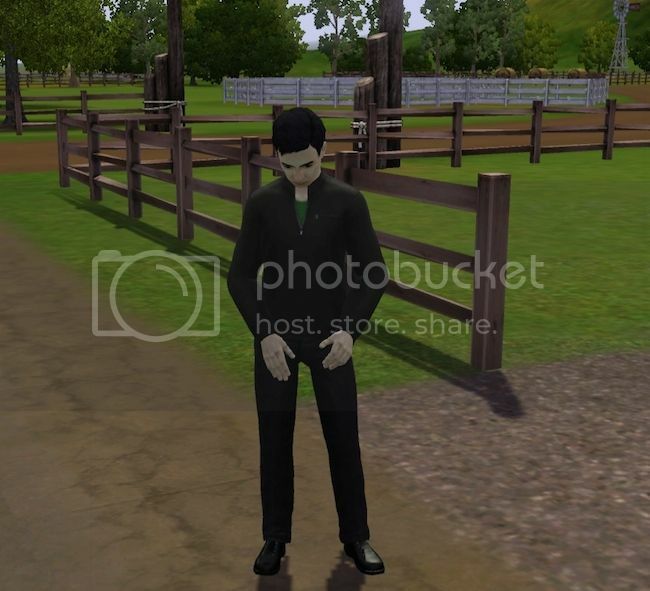 Mucked about in Appaloosa Plains today. For me it is quite slow to load, but once it's there it's OK. 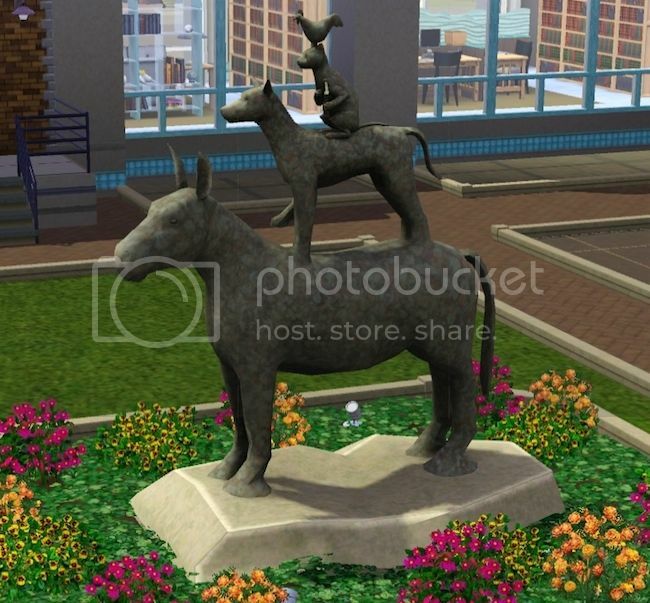 Although I've played it before, I'd never noticed this statue of stacked animals. Reminds me of the preparation for a five-bird roast! 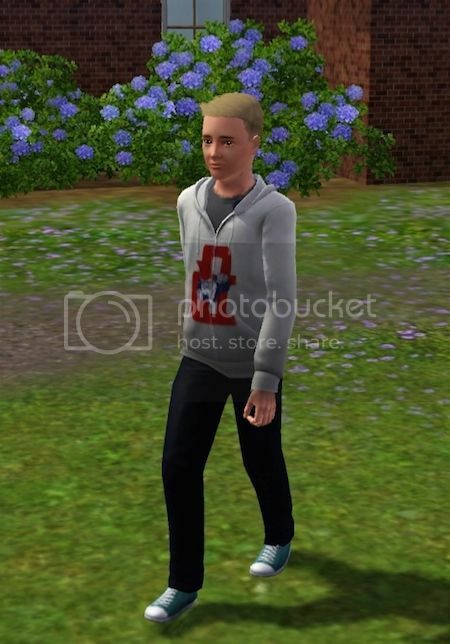 After a considerable struggle with the sims3.com website and the funking stupid launcher, I managed to get the new Ollie downloaded and installed. What a battle! Then he crashed CAS about five times but fortunately I am not one to give up easily. Here he is - complete with new hair! 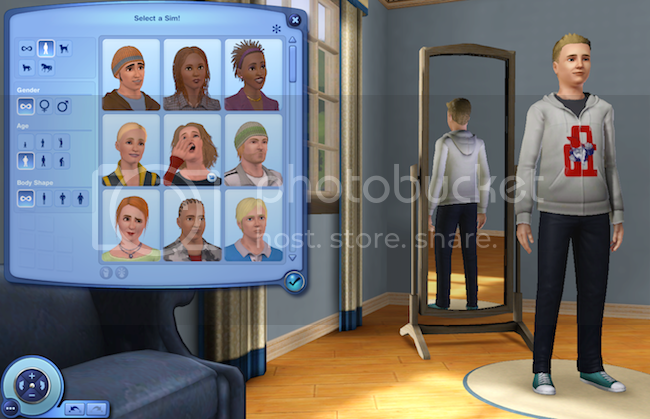 I also had to laugh at the version of Caspin from the library on the left - the only sim yawning their head off! Having defeated my mighty Launcher foe I was ready for some relaxing play. 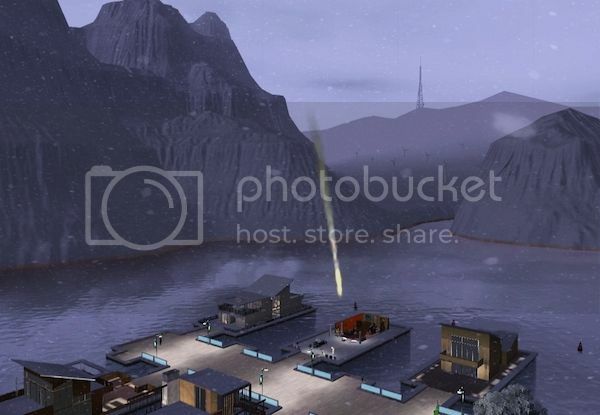 Fortunately the sims didn't let me down. My goodness, did they indulge in some bizarre behaviour! 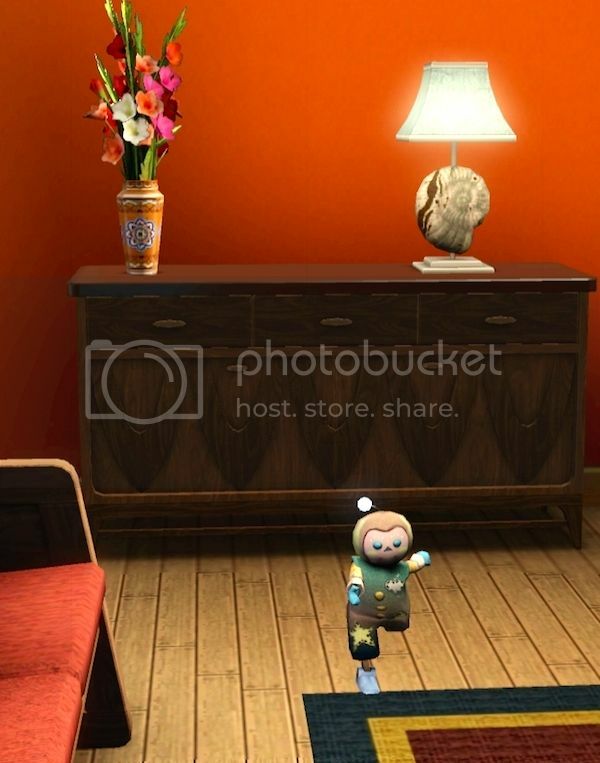 Ollie behaved relatively sensibly in-game. 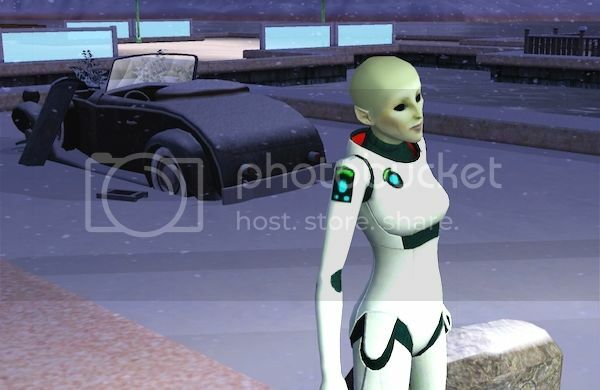 Sorry for the dubious graphics, I was having trouble so turned down some of the settings. It's made us all a bit fuzzy. Minty, on the other hand, started acting loony as soon as he arrived in town. Erm, put your hands somewhere else?! I think maybe you'd better go back inside your house! Later I spotted both the boys getting makeovers down at the salon! I can't say that Minty's behaviour got much better. 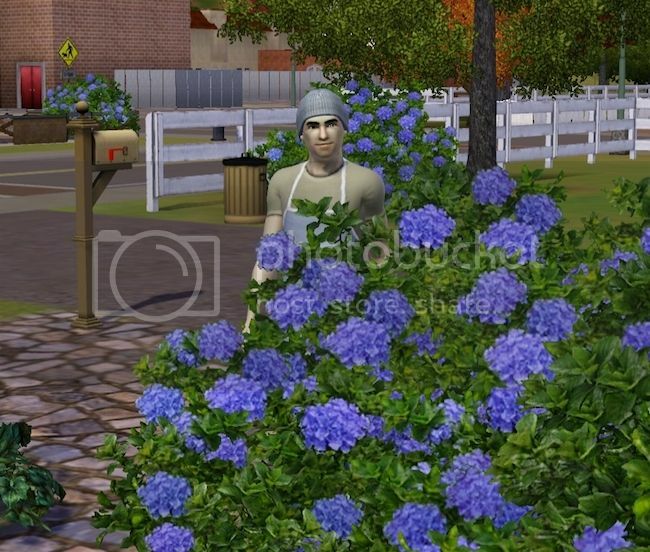 My sim was quietly reading at home when I noticed him standing in the bushes in the front garden! I decided to invite him in for a cuppa in order to end the madness, which then of course resulted in everyone being in the bushes for a while. I had a go at making glass at that art gallery whatsit. 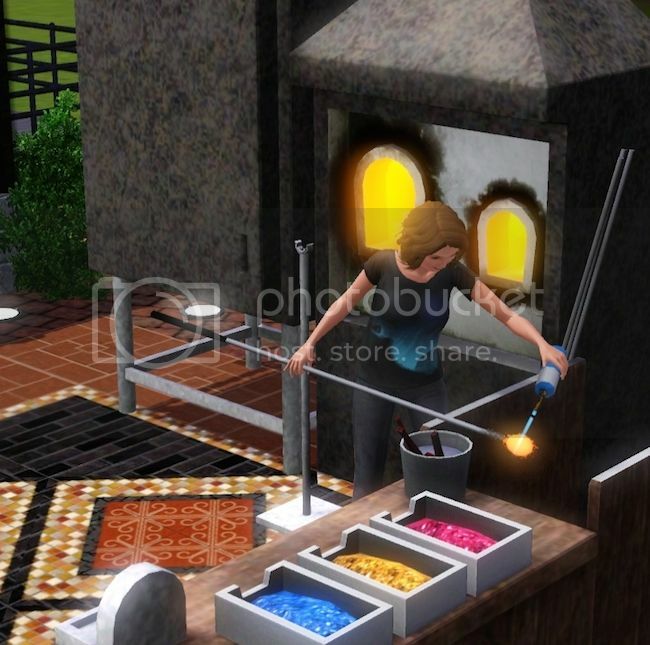 There don't appear to be any health and safety concerns about sims waving around molten glass. I'm pretty sure that metal stick that you keep putting into fire will get hot! You can make quite a lot of things, including a set of glass gnomes, which are surely the most useful invention and I have no doubt that all glass blowers aspire to produce such works. I, on the other hand, decided to make perfume bottles. Amazingly, not only does the glass-blowing result in the production of bottles, it also fills them up with perfume. Win! I'll just spray this in my face! OK, great plan. Good luck with that. 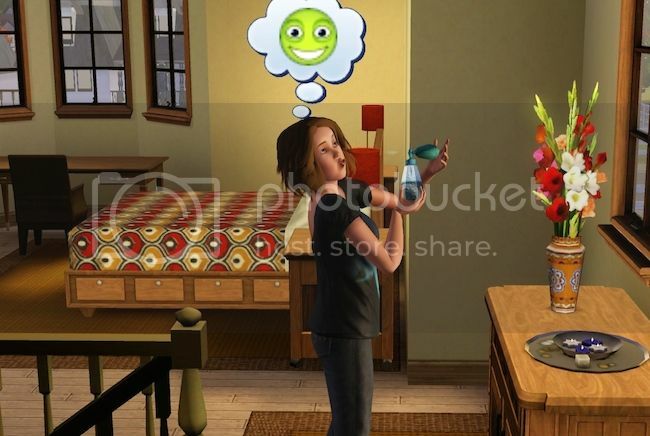 I swear the sims get nuttier every time I play them!